At 8pm(ish) on Friday 6th December we were told that an ECHO performed earlier that evening had flagged up a couple of problems. Martha had poor circulation and there was significant shunting through the residual VSD. The Cardiologist was convinced these issues were the root cause in the pause in her progress. A meeting was held with the entire Cardiology and Surgical team on Monday. But Martha's Surgeon didn't believe the problems were that significant and that it was worth the risk of operating again. However, the Cardiologist argued his case and ordered a Diagnostic Catheterization to support the findings in the ECHO. anxiously waiting for her to return to the ward. She returned shortly before 6pm - crying, I was relieved. 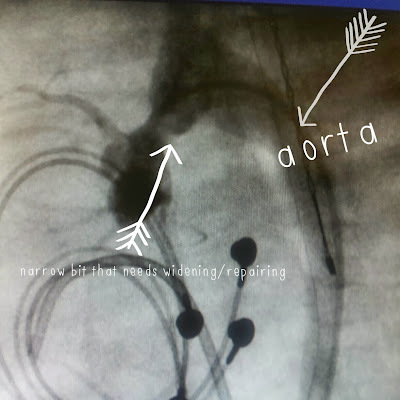 The Cath technician followed her to her bedspace and informed us that there was a narrowing to her Aorta just above the Valve. The bi-ventricular shunting was also more worse than the ECHO portrayed it to be. There was only 1 option - she needed Open Heart Surgery again. Tuesday morning we were informed that she was booked in for Thursday, 2 days time. I had promised Osh that I would go home Tuesday night so I could watch his School Christmas Concert on Wednesday evening. This meant leaving Mother Dearest on her own in London for two nights. The break at home and seeing the other two was something I hadn't realised that I desperately needed. A break from the heartbreaking environment of Intensive Care. We caught the 6:20am Bangor to Euston train, we had been given the message that Martha was second on the Theatre list for Thursday. We were at the Hospital just after 10am. We informed the nurse that we hadn't spoken to a surgeon or consented to the Operation - without doing so the Op could not take place. At 11:30 the registrar was at our bedspace. They had two jobs to do that day; find the residual VSD and close it then widen the Aorta. My head was buzzing with so many questions; what if they can't find the VSD; what are the chances of her returning to the ward on ECMO. Eventually he snapped "You're asking too many questions and you're not helping yourself - I know what you're like by now. As far as we are concerned we have two jobs to do today, we will be able to do both - that's all you need to know!" At 12:15 the Anesthetic team arrived. They knew we hadn't seen the surgeon but said if we wanted they could take Martha down so they could get her ready for the Operation as they needed an hour with her themselves first. We reasoned that the sooner they could begin the sooner she would return. Again, I kissed her good luck and watched them wheel her away. Not knowing if we'd see her alive again. Mark went with her to the Anesthetic room. He arrived back on the ward just in time to speak to the Surgeon. He was keen assure us that it was better to do the op now rather than wait and do it further down the line. He also told us that this procedure was much less work than the previous one four weeks ago. We sent our families and friends a quick text that she'd gone down at 12:30 and that we expected her to be there for 7-8 hours, although in reality we were told 4-6hours. We went for a bite to eat to the Lagoon and drank copious amounts of Panads. At around 2:15pm the Anesthetist walked in and queued for his lunch. The three of us sat there staring at him; shouldn't he be with Martha? He walked past us again and smiled at us. Then he walked to our table - "Don't worry, we're on By-pass - she's fine. I have a team of five up there taking care of her!" We made our way up to Flamingo by about 4pm. We read magazines, drank more tea, dosed in and out of sleep and chatted nonsense to try to distract us. Mark's phone starts ringing. Private Number. It's only 5:20pm. Surely it's too soon for them to have finished? It was the Surgeon's registrar. Martha was back on the Ward. The Operation had gone as planned.